Ristorante I Raddi in Florence. 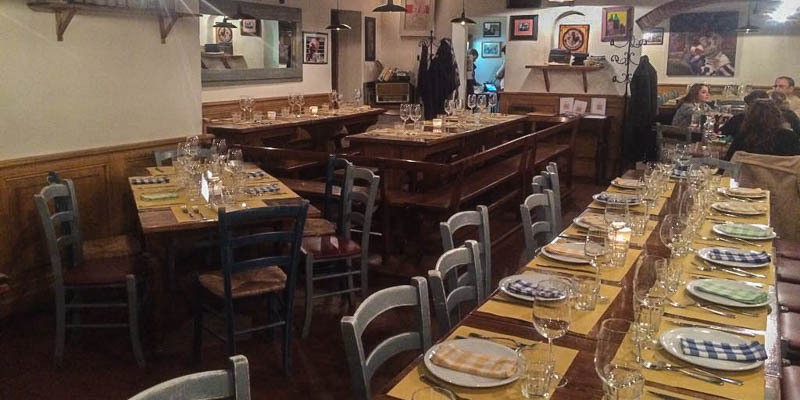 Luccio's trattoria hidden in the heart of the Oltrarno is a true find—excellent cooking at reasonable prices in a city rapidly overpricing itself. The beamed ceiling and Tuscan standbys on the menu give it a grounding in tradition while the young staff and light touch in the kitchen lend a fresh Bohemian air. IN fact, the menu is siplit between dishes that are "Tipico" (Florentine/Tuscan), "Nazionale" (Italian), and "La Mia Cucina" (the chef's own inventions). The specialty is tagliolini ardiglione (with sausage and aromatic herbs), but they also make a mean crespelle alla Fiorentina (pasta crepes layered with cheese). They do a fine cibrèo, a tasty peposo alla fornacina con spinaci (beef baked in wine with lots of pepperoncino and served with spinach), and a spicy fagioli all'uccelleto con salsiccia (cannellini beans, tomatoes, and sage simmered with sausage).